Update: Version 1.3.1 is now available. 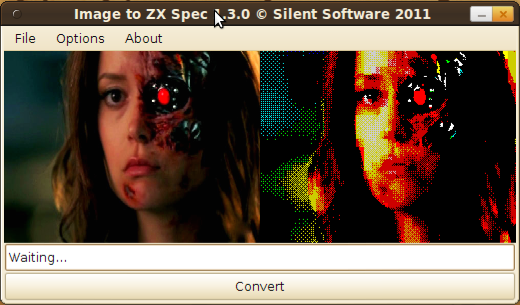 Version 1.3.0_01 of Image To ZX Spec (more details) has now been released and is freely available. Image to ZX Spec is written in Java and will work on Windows, Linux (tested on Ubuntu) or any Java 6 capable operating system. - Added support for drag and drop on Ubuntu. - Minor Ubuntu window size issue fixed. - Fixed bad line numbering in Simple BASIC Loader.